Mundo, our student scientist, caught wind of a potential massive attacking happening on his home, the Virtupets Space Station. Upon hearing the news, he decided that he could not just sit idle and wait for the enemy to strike. He had to do something. He wanted to be a part of history and make a positive impact. So he chose to run out of his apartment pod, despite the station wide lockdown, and deliberately disobey the law in order to do something. "This is a LOCKDOWN. You are under arrest, you are not allowed to leave your pod. Since you can't obey that order we will put you in the pod prison to keep you in order." The Grundos then grabbed Mundo up and dragged him off. He was taken off to a jail pod, where he had all his emotions and anxiety wash over him. It all had taken a toll and left him exhausted, so he laid down to sleep. "Hey, get up," a sharp whisper cut through the silence and jolted Mundo awake. "Be quiet!!" "Wh-what? What's going...what's going on?" Mundo was clearly disoriented from being half asleep, and his brain was foggy. "The power went out, all the pods malfunctioned." Mundo's vision started to get a bit clearer as he wiped the sleep from his eyes and he could see it was the Acara inmate from earlier in front of him. Shocked, he backed up against the wall. "I'm on your side here kid, get it together," the Acara said. "The name is Petrina. Good to meet ya!" "Hi...hi Petrina. I'm Mundo," Mundo replied shyly. "Mundo the Grundo! What a name...geez your parents weren't doing any favors," another voice cut through, as the Lutari approached. "I'm Tyree. We're going to bust out of here now, you in?" "You can't just break out of prison!!" Mundo was not down for this plan, he was a rule follower and a good citizen, he didn't want to get mixed up in all of this. "It's either break out of prison and have a better shot at living, or wait in this cell for whatever is out there to come in here," said Petrina with a bit of anger in her voice. "We have to do something, I don't want to just sit in here. And I know that is why you were arrested, cause you were out there doing something. You and I have something in common, we want to get things done." "You are a criminal though, you are in prison for a reason," said Mundo defiantly, he didn't think he was anything like her. "Okay smarty, then what does that make you, huh? You're in prison too," Petrina snapped back. "I just left my house during a lockdown, I was trying to help." "And why do you think I'm in here? Cause I robbed an old lady? No, I made a typo on my tax return and couldn't afford the fine so I'm serving time," Petrina scoffed, angry at Mundo's assumption that she was some type of hardened criminal mastermind. "Now what do you mean you were trying to help?" "Oh..uh..I'm sorry..I didn't mean to assume anything about you," Mundo was embarrassed. "Well..I'm a science student, I build things a lot and I recently built a ray machine at my school laboratory. I was using it on food originally, but I thought maybe I could turn it into a weapon to use against the UFOs. But I've only ever used it to make food, I'm not a battle scientist, I'm a food scientist. I've been working to create the most delicious and nutritious food in the universe." "Sounds good, let's do it," Tyree said, he clearly was not one to mince words or waste time. He had a very let's-get-to-it attitude. "He's right, let's do it. We'll follow you and help keep watch. Whatever you can make in the lab can't make the situation any worse," Petrina said. And with that, the three of them took off into the darkness. The electricity was out everywhere, but most of the space station is just long hallways lined with rooms, with an elevator and staircase popping up occasionally. Tyree was an expert in navigation it appeared, so the other two just help onto his tail and blindly followed. They were careful not to move too fast, as not to alert anyone of their escape and also to keep from getting lost. It took them nearly two hours to navigate back to the main level, and back to actual freedom, but now they were there. It was Mundo's turn to take over leading, since he knew where the lab was, but..
"Who goes there?" A voice boomed through the darkness. "Shh..I don't think he has a flashlight," whispered Petrina. "How do you know that?" Mundo questioned her. "He would be using it to look at us," Petrina said in an annoyed tone. "Duh." Mundo pressed on, quietly, with the other two close behind. The darkness was almost suffocating, it was darker than he had ever seen it before. Usually there is a faint red glow throughout the station from backup or emergency lights, and in his pod he has the constant twinkle of the stars to gently illuminate his room. But this, this was something he has never experienced. He couldn't even see his hand in front of his face, and it seemed like his eyes were never going to adjust...it was darker than dark. After a bit more time, and a few wrong turns, Mundo let the two others know that they were almost there. And right after he expressed that thought, the lights above blinded him. The electricity cut back on, leaving the three of them exposed in the middle of a hallway. 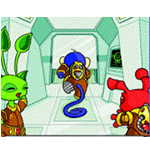 They quickly ducked into the nearest room, just in case one of the Grundo guards was still lurking around. "I wonder what is going on outside the station," Petrina pondered out loud as she walked over to a nearby window. "Oh...my..."
Mundo and Tyree rushed over to the window to see, and right on the other side of the glass was a UFO, and inside they could see a green creature with many ears staring right back in at them...it looked kind of like an Aisha, but an Aisha they had never seen before. And as soon as they locked eyes, the alien rammed their ship into the glass, shattering it into a million pieces. The alien entered through the window and stepped out of their craft, as the three prisoners scrambled back to the door they came in. "OPEN IT ALREADY," Tyree screamed as Petrina was struggling to force the door open. "IT'S LOCKED," Petrina shrieked, desperately trying to pry to locked door open. The Alien Aisha pulled out a ray gun and pointed it at the three, and it walked closer towards them. Terrified, the three just began screaming incoherently, all speaking over each other and making an inaudible wall of sound. So loud, they could not hear the new visitor trying to speak their demands. Frustrated, the Alien Aisha shot off its ray gun at the wall. "SILENCE," the Alien Aisha said. "I do not want to hurt you, but I do want something from you." "Wh-what wh-what wh-what is- what is it?" Tyree's voice was trembling through every word he spoke. "Wh-wh-what do- do you- what do you- you want?" "I desire to have the most delicious food in the whole universe, and my quest has led me to your space station," the Alien Aisha spoke with a firm voice. "I have brought my entire family with me, and we are here to dine on the finest cuisines you have to offer." "Well, that could not be more perfect, Mundo," said Petrina, looking over and smiling at Mundo. "My buddy here is a food SCIENTIST, he creates incredible cuisine with a simple laser beam!!" "Uh...I'm not that good yet..." said Mundo nervously, obviously shaken by the events. "But if you give me some time, I'll see what I can do." "Hmm...ok, you have 24 hours to deliver us a dessert that is to our liking," responded the Alien Aisha. "We will continue to wait outside." The alien got back in their space ship and blasted back out of the space station, joining in an orbit with the rest of their "family". Mundo was in a state of shock and also panic over the events that had just transpired. "What am I going to make!? My laser failed the last experiment, the nutritious food just made it taste terrible," Mundo cried out. "So don't put the nutritious food in, just let it taste good, who cares if it's healthy," replied Tyree. "We aren't concerned about the health of a potential threat to our lives, right? They could blast us into smithereens at the press of a button, we just need to convince them to leave." "Okay, well, the laboratory isn't far. Let's go now so we can get this together as fast as possible," said Mundo as he regained his composure for the long night ahead.